NASA wins Twitter's "Shorty" award for its Martian "tweets"
By mission's end, more than 38,000 people were following NASA's "tweets"
NEW YORK (CNN) -- NASA was honored Wednesday for its efforts to inform the public through the popular social-networking Web site Twitter. More than 38,000 people followed NASA's "tweets" of the Mars Phoenix Lander mission. NASA received the "Shorty Award" for documenting the mission of the Mars Phoenix Lander. 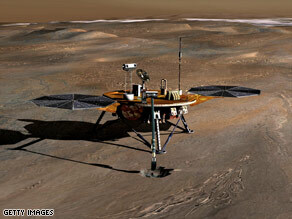 The Mars Phoenix Lander spent nearly five months in 2008 on the red planet conducting research. Twitter allows users to post updates or "tweets" in 140 characters or less. NASA said it delivered more than 600 updates during the 152 days the Phoenix was operating in the north polar region of Mars. By the end of the mission in early November, more than 38,000 people were following its tweets, NASA said. "We created the account, known as Mars Phoenix, last May with the goal of providing the public with near real-time updates on the mission," said Veronica McGregor, a NASA spokesperson. "The response was incredible. Very quickly, it became a way not only to deliver news of the mission, but to interact with the public and respond to their questions about space exploration." NASA beat out several science bloggers and was honored at the award show in New York hosted by CNN's Rick Sanchez. All About NASA • Mars Exploration • Twitter Inc.